Nine years after launching a program to measure the impact of bike and pedestrian investments in four communities, the Federal Highway Administration credits the program with increasing walking trips by nearly a quarter and biking trips by nearly half, while averting 85 million miles of driving since its inception. In 2005, the FHWA’s Nonmotorized Transportation Pilot Program (NTPP) set aside $100 million for pedestrian and bicycle programs in four communities: Columbia, Missouri; Marin County, California; Sheboygan County, Wisconsin; and the Minneapolis region in Minnesota. Each community had $25 million to spend over four years, with most of the funding going toward on-street and off-street infrastructure. According to a progress report released this week, about $11 million of that remains unspent, though the communities also attracted $59 million in additional funds from other federal, state, local, and private sources. “The main takeaway is, we’ve now answered indisputably that if you build a wisely-designed, safe system for walking and biking within the context of a community that is aware of and inspired by fact that it is becoming a more walkable, bikeable place, you can achieve dramatic mode shift with modest investment,” said Marianne Fowler of the Rails-to-Trails Conservancy and an architect of the pilot program. Columbia reconfigured a key commuter intersection to making walking and biking easier and safer, resulting in a 51 percent jump in walking rates and a 98 percent jump in biking at that location. 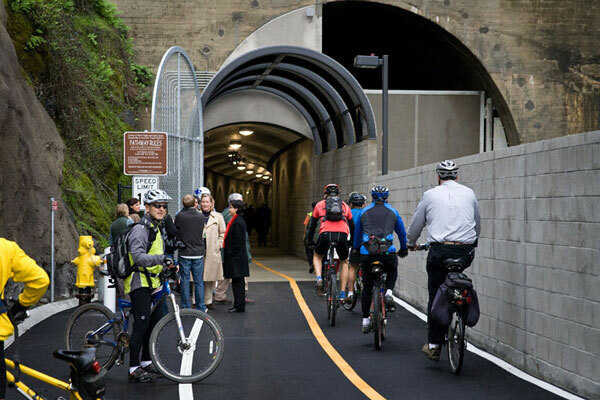 In Marin County, the reconstruction of the 1,100-foot Cal Park railroad tunnel and construction of a 1.1-mile walking and biking path provided direct access to commuter ferry service to downtown San Francisco and reduced bicycling time between the cities of San Rafael and Larkspur by 15 minutes. Biking along the corridor increased 95 percent, and a second phase of the project is still to come. FHWA could see the impact: At locations where better infrastructure was installed, walking increased 56 percent and biking soared 115 percent. Using a peer-reviewed model, FHWA also estimated changes in walking and biking throughout the four communities. The program led to a 22.8 percent increase in walking trips and a 48.3 percent increase in biking trips. Without the interventions, residents would have driven 85 million more miles since the program launched, according to FHWA. Those 85 million miles add up to a lot of traffic misery avoided and emissions not spewed into the air. The pilot program saved an estimated 3.6 million gallons of gasoline and 34,629 tons of CO2 emissions between 2009 and 2013 — not to mention the savings of 33.4 tons of hydrocarbon emissions, nearly 500 pounds of particulate matter, and 304.6 tons of carbon monoxide in 2013 alone. While safety improvements across all four communities can’t be directly attributed to the program, FHWA estimates that “despite large increases in nonmotorized transportation, the pilot communities collectively observed a 20 percent decline in the number of pedestrian fatalities and a 28.6 percent decline in the number of bicycle fatalities from 2002 to 2012.” Pedestrian injuries went down between 18 and 55 percent in each of the four communities. Meanwhile, bicyclist injuries increased in three of the four communities, but “bicycling injury rates (incidents per number of trips) declined between 8.6 and 38.2 percent in each of the four communities.” That kind of statistic — injuries and deaths per bicycle trip — is hard to come by in most of the U.S., where bicycle trips are largely uncounted. Where did the rest of the funding go to? There’s a UC Study that shows that people that bike can *gasp* get hurt, which is completely different than the utter safety of driving a car or walking. Great to know there’s no such thing as car/pedestrian accidents. Thanks Bob! Presumably at least some went to data collection, staffing, studies, and other administrative features that are essential if we want to get the projects done right, and find out what the results actually are (as reported here). It differed per pilot community. I managed the Sheboygan County Pilot from 2006 – 2010. In Sheboygan, the money was also spent on bike parking, production of comprehensive bike/ped plan, sidewalk gap filling, SRTS planning, events like bike/walk to work week, education (e.g. bicycle rodeos, law enforcement safety training). Staffing and admin costs were also a part of the expenses. They did quite a lot of education and outreach in Columbia. A series of bike ed classes and so on, public relations work to encourage people to bike and walk more, outreach programs to neighborhoods to encourage people to walk, and so on. And this is a bad thing because . . . ? When you normalize the numbers by mode share – which is difficult because there’s no good way of tracking the many people like me who drive, bike, and walk about equally – riding a bike in the US is statistically only slightly more fatal than riding in a car, despite what fearmongers want you to believe.